I feel this could have very easily been a New Avengers story because of the espionage plot and the twists & turns involved. It's an enjoyable enough tale but I can imagine Steed being the one holding all the aces with Purdey and Gambit doing all the running for him. I'm surprised there aren't more comments on this episode. I quite like it. A complicated plot with lots of twists and turns with good action scenes. Everybody is scheming against everyone else. 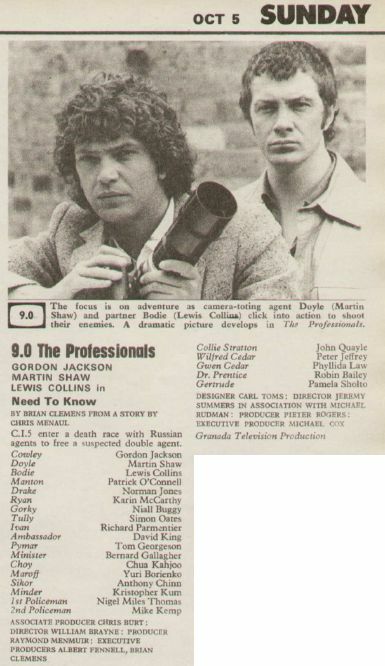 Bodie and Doyle playing copper is a nice touch. It's a very good epiosde PR1, in my opinion anyway. It was one of the last episodes I watched when I got my Profs box set around 12 years ago. It almost feels like a forgotten episode this one. I saw it on Granada plus in 1997 and when I got back into the series in recent years, I thought I barely remember anything about it. It's an excellent episode, slightly complex, but satisfying. I had to laugh when Cowley gives Bodie & Doyle oxygen after the gas attack and they just leave the Chinese bloke behind.